Built to a design by Cor D Rover, the yacht’s striking contemporary interior was designed by Michaela Reverberi and was a finalist in the 2012 World Superyacht Awards. 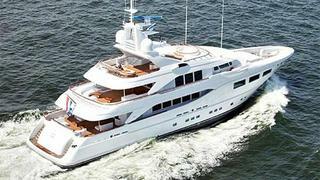 She accommodates 10 guests in a main deck full beam master suite, two doubles and two twins. Water toys include two tenders, three jet skis, two Seabobs, water skis and a range of towables. Weekly charter rates on Snowbird start from €165,000 in high season and €150,000 in low season.